Many organisations and individuals approach NSW Department of Primary Industries (NSW DPI) seeking information about options for controlling carp in particular areas or situations. These pages provide much of the necessary information. Anyone interested in reducing numbers of carp in an area, whether private waters or part of a natural river system, needs to consider a range of issues before proceeding. What options are available to control carp? Carp is a significant pest species and understandably, many people have a strong desire to eliminate them or at least reduce their numbers. Unfortunately, the options available for the public to effectively control carp are limited and any one option on its own is unlikely to be effective. Which option(s) is suitable for a particular situation depends on a range of factors, such as the type of waterway where the carp are found, whether it is privately owned or publicly managed, and the resources available for control work. What about other methods like traps and poisons? Use of fishing equipment in non-compliance with the fisheries regulations. The normal fishing rules apply to all forms of fishing, even fishing to control pest fish. Use of fishing gear in illegal ways is not acceptable and may lead to prosecution. Rotenone – NSW DPI holds a permit from the Australian Pesticides and Veterinary Medicines Authority to use rotenone for pest fish control in some circumstances under very strict conditions, but its use must be supervised by trained officers from the Department. Use of rotenone in other circumstances is illegal. Other chemicals, electrical devices or explosives – it is illegal to use any other substance (eg. lime or copper sulphate) as a fish poison. 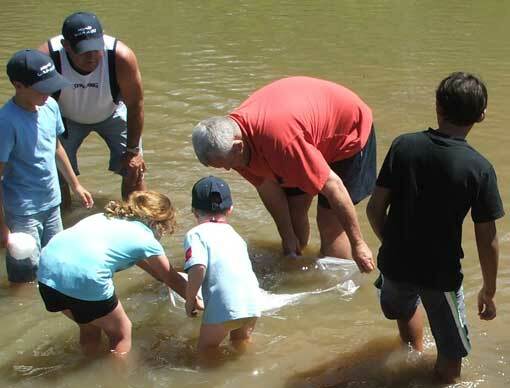 Other methods such as electrofishing cannot be used without a specific permit from NSW DPI. Can NSW DPI come and do some carp control work in my area? Unfortunately, carp is so widespread and abundant in NSW that NSW DPI does not have the resources to send staff to remove carp from local sites on request, even when conditions appear to be favourable for carp removal (eg. large numbers aggregating below a barrier). What can we do to make sure our efforts to remove carp are as effective as possible? Carp are very mobile, so unless the waterbody is completely isolated from other areas containing carp, new carp will soon move in to replace those you remove. Combining carp control work with other actions to improve aquatic ecosystem health, for example revegetation, re-snagging, erosion control, restocking of native fish and community education. How do we dispose of the carp we catch? You need to plan how to humanely euthanase any carp you capture – particularly if there are likely to be large numbers involved (eg. draining a dam or a community fishing event). Information on humane and acceptable methods of euthanasing fish can be found on the Department’s animal welfare page. NSW DPI promotes ethical and conservation-based fishing, and one of its key messages is that fishers should only catch what they need and use what they catch. 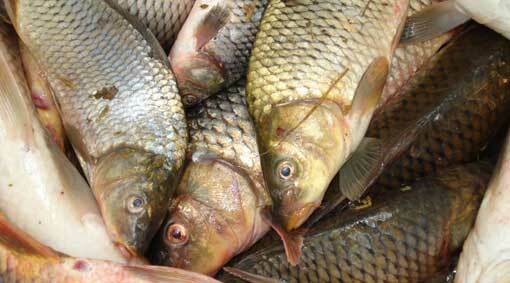 Even though carp are a pest, it is still unethical to waste them or treat them inhumanely. Before commencing any carp control attempt, make sure you have a plan in place to use the captured carp. If you expect to catch large numbers, it may be possible for them to be utilised by a commercial operator. Note that harvested carp cannot be sold, unless taken by a commercial fisher. Alternatively, contact a carp processing company, fish farm or other enterprise in your area directly. For smaller quantities, options include eating, using as pet food, or composting. The following is a list of some links you may find useful (noting that NSW DPI does not endorse any particular private company or the content of any particular website). Victorian DPI fishnote on composting fish waste – note however that you should contact the NSW Department of Environment, Climate Change and Water for details of NSW waste regulations. Composting. A Disposal Method for Fish Waste - note however that you should contact the NSW Department of Environment, Climate Change and Water for details of NSW waste regulations. What about restocking with native fish? It may also be worthwhile, following an intensive carp control effort, to consider restocking the area with native fish. Native fish may have an impact on juvenile carp numbers, although the extent of any impact is unknown. Any proposal to stock fish in public waters must be submitted to NSW DPI for consideration (it is illegal to stock fish in public waters without a specific stocking permit). Industry & Investment NSW will consider any stocking request in accordance with the Freshwater Fish Stocking Fishery Management Strategy. However, as there is currently little scientific evidence for the impacts of stocking on carp populations, permits will not be issued for stocking where the sole or primary purpose is to control carp numbers. Ideally, fish stocking should be combined with aquatic habitat protection / rehabilitation to increase the competitive advantage of native fish over introduced species such as carp.